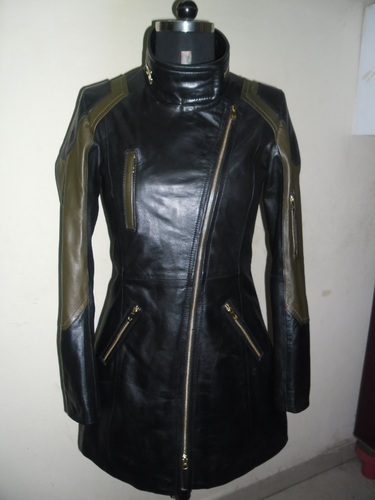 Enriched with vast industrial experience, we are involved in offering a wide range of Ladies Leather Coat. These are available in all standard sizes and finish as per the precise demands and specifications of clients. Manufactured using top quality leather, these coats are acclaimed for their maximum durability. Packaging Details Garment packing: LED covers with 32x26 in inches. Box packing: Dimension- 34x 28x10 RAfia sheet/ Gunny packing method with metal clips on the boxes with patti straps. Suryaa Leathers was incorporated in the year 2011 as a sole proprietorship firm. We are leading manufacturer, exporter and supplier of Leather Jacket, Leather Coat, Bomber Jacket, Trench Coat, Blazer Jacket, Collar Jacket, Hosiery Jacket, Men's Short Jacket and much other variety of products. We carry about 100% export in countries such as US, Europe countries and many others. These products are manufactured from high quality raw material procured from reliable vendor source. Our vendor participates in various quality workshops. This helps them in widening their knowledge regarding quality aspects. Further they offer us with quality raw material. We are able to manufacture and deliver our esteemed clients with products bestowed with quality.